Thank you Houston Business Journal! Bennett’s Curse Haunted House in Baltimore Maryland Is names the Nations Best Haunted House! Thank you for naming Bennett’s Curse Haunted House the Nations Best Attraction. Visit Bennett’s Curse Haunted House this weekend and see why we are named the Nations Best Haunted House! We appreciate all the support from our guests. Please keep supporting our small businesses in Maryland so we can continue to grow and bring you the best Halloween interactive entertainment you deserve and expect. 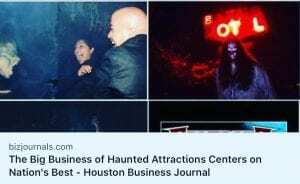 Bennett’s Curse Haunted House is OPEN this weekend. All indoor including the waiting area. FREE Paved parking lot.